Vacuum forming is the process of taking large sheets of plastic, heating the sheets to a temperature that makes them pliable, then using a vacuum to remove all of the air out from between the heated plastic sheets and a pre-made mold. Depending on the type of material used, vacuum forming can be performed rather quickly. 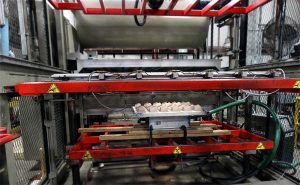 While vacuum forming is a technology that has been surpassed by other methods of thermoforming, it still provides value for specific use cases. At Advanced Plastiform, Inc. we’re committed to the success, quality, and consistency of the products that we thermoform for you, which is why we take it upon ourselves to fully manage your vacuum forming project from beginning to end. Our staff and engineers are knowledgeable and experienced with all kinds of thermoforming and will help guide your project to the right process, whether that is vacuum forming or other types of thermoforming. We design and engineer the mold, fabricate the prototype, vacuum form, trim, and finish all in-house, ensuring that your final product is to exact specifications and is high quality. Overseeing all parts of the process allows us to control every aspect, to ensure that your product is customized to your specifications and needs, and to make certain that the project is completed in a timely and cost-effective manner. The advantages of vacuum forming shine through for large products where detail or sharply defined edges are not necessary, such as car bumpers and dashboards, body panels for recreational vehicles, construction and farm equipment, and much more. Using a composite mold, the vacuum thermoforming process can prove to be cheaper to produce large plastic products. Another benefit it provides is the ability for rapid product development. Additionally, vacuum forming has advantages over other types of thermoforming because it uses low pressure to thermoform. This helps to keep the final tooling costs down and means that less expensive materials can be used to create the mold. Due to the low cost of materials for the mold, it also keeps the prototyping and fabrication of the mold times down, which means that even for limited or low quantity runs, your project will be both cost-effective and quick. 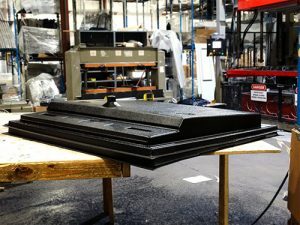 Part of the appeal and convenience of thermoforming vacuum forming over a different process such as injection molding is that the finish trimming and tooling process is much shorter. Once the part has been formed and cooled, it needs to be trimmed of excess plastic and tooled to ensure that it matches the prototype exactly and that the part is up to specifications and within tolerances. When the trimming and tooling process is completed, the part is mostly ready to go, barring any reinforcing, assembly, or decoration. In the past few decades, there has been the success of inventive minds in the industry who have found ways to use the process to produce high-quality, much-needed custom plastic products. Research and development in thermoforming have continued to keep vacuum forming on the cutting-edge of technology. The efforts of bright minds in the industry push the boundaries on the types of materials that can be used in vacuum forming or designing molds that allow for a more unvarying vacuum across the entire surface of the mold. Advanced Plastiform, Inc. offers breakthrough technologies and advanced custom plastic manufacturing machines. Quality, consistency, and on-time delivery comes from our dedicated commitment to clients. It’s how we’ve separated ourselves from the competition and earned our top-rated reputation in the thermoforming industry. Find out how we can design, engineer and deliver your vacuum formed custom plastic component to help your business succeed! Contact us today to request a quote. At API, we’re experts in thermoforming and vacuum forming. Investing in the latest technology and processes allows us to produce better quality custom plastics for you on a precise production schedule. We offer custom, high-quality manufactured plastic components to companies like yours in North Carolina, South Carolina, Georgia, Maryland, Pennsylvania, Tennessee, and Virginia. To get started on your vacuum forming project, please contact us today by calling 919-404-2080 or filling out our form below to discuss your custom plastic manufacturing needs.